alk up the front steps of Ginger and Baker, the larger-than-life food hub in the Fort Collins’ River District, and you wouldn’t be the first person to pause in the doorway to take it all in. A barista pulls a thick slab of quadruple coconut cream pie from the case, bits of flaky, golden crust falling on the plate. Laughter echoes from the large kitchen classroom in the back where students are rolling out dough. To the left, The Café hums with conversation as wait staff serve plate after plate of the ultimate comfort food—all-day breakfast. It’s like being transported back in time, standing at the threshold of your favorite kitchen on the morning of your favorite memory. There’s a buzz of friendly conversation. The anticipation of good things to come. And, good Lord, it smells divine—a mix of brewing coffee, fresh-cut flowers and bubbling pies straight from the oven. The building feels happy, like it knows it has purpose again. Obvious care has gone into restoring the old Northern Colorado Feeders Supply building, brick by exposed brick. What was once a spot where folks stopped in to buy feed and baby chicks and swap gossip is now a communal hub of a different sort—a gathering space and farm-to-table utopia with a coffee bar, bakery, retail market, two restaurants, rooftop bar and lounge, dog-friendly patio, teaching kitchen and two private event spaces unlike any in town. It’s a realized dream, with hospitality at the heart of everything. Her house is your house. Ginger Graham’s Southern mama Earlene taught her that. The auburn-haired Graham extends a warm smile and handshake to a first-time guest, and soon they are talking and nodding in agreement about something, heads bent together like old friends. House proud, Graham offers her a personal tour. For Graham—who owns and is a founder of Ginger and Baker with husband Jack—that sense of welcome is a cornerstone of the new multi-faceted culinary business. “My mom is a big part of this building and who I am,” she says, pointing out Earlene’s pie safe that currently displays gifts in the marketplace. “She taught me hospitality through feeding people. She taught me how much joy can be in the kitchen.” She also taught Graham about the value of hard work, things made from scratch and using every scrap of what you grow. The bakery/market/cafe/restaurant/classroom (Traylor teaching) hybrid concept sets Ginger and Graham apart. Raised on a farm in Arkansas, Graham learned at an early age how to milk cows and make butter, sew her own clothes and grow her own food, dress a chicken and buck hay. After being crowned Miss Rodeo Queen Arkansas 1976, she graduated with an agriculture degree from a land-grant university, earned a Harvard MBA and went on to lead Fortune 500 and Nasdaq 100 companies before landing in Colorado. The two women agreed that pie is comfort and so much more. “Pie represents this idea of things that are homemade as a gift from one person to another, something that’s crafted with love, something that takes time,” says Graham. 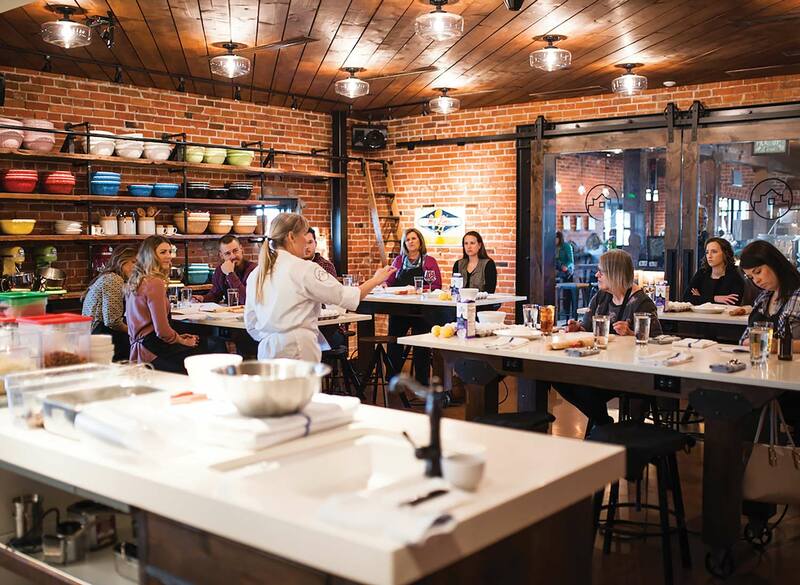 The women decided to share their love of fresh, locally sourced food made from scratch, and give people a good reason to slow down and savor the moment. And it almost did. Several times. And just like baking a homemade pie, the renovation became a labor of love. The Grahams soon realized that in order to protect the crumbling grain mill, it needed major structural reinforcements, and the commercial kitchens would need to live in a newly constructed building. Inspired by Jack Graham’s design vision, the local firm Vaught Frye Larson Architects made it come to life. The new addition is not a vanity piece,” Traylor says. “It saved the old building.” The new construction also ensured accessibility for all guests. Graham and her husband patiently navigated the cumbersome federal, state and local historic review processes as they saved the old grain mill, and the $12 million building is now on the National Register of Historic Places and the State Register of Historic Properties. It won the 2018 Governor’s Award for best adaptive reuse and rehabilitation of a downtown historic property. After 15 months of renovation, on November 18, 2017—Graham’s birthday—Ginger and Baker opened for business. The restored grain mill lives on as a community gathering place and a lasting reminder of Northern Colorado’s deep agricultural roots. And like any good homestead, it takes an extended family to make it run. As owners of Ginger and Baker, the Grahams constantly work to improve the experience, and Graham gives her husband full credit as the steady force that saw the challenging renovation through to completion. Culinary director Traylor is a key part of the food-driven vision and leads most of the classes in the teaching kitchen. The rooftop deck invites dining al fresco and offers event space. And today, the head “baker” in Ginger and Baker is Rachel Brickel, a New Yorker Graham describes as nothing short of a miracle worker. “She’s a young woman with a steel core who is really stepping beyond her own bounds and responding to my desire for homey, approachable pastries, even though she’s trained in the French methods,” Graham says. Brickel and her staff also bake the fresh bread and desserts used for every in-house menu, which is no small feat. To ensure the savory menus are in equally capable hands, Traylor and Graham hired head chefs who could, among other things, make a damn fine pie. As the final part of the interview process, “We asked all of our chef candidates to bake us a pot pie using their own recipe…some of them came with their mom’s recipes for pie crust. That really symbolizes their pie story,” says Graham. The head chef for The Café is Danny Selig from Aspen’s Little Nell, and the chef du cuisine for The Cache and house events is Tucker Creveling, a Fort Collins native most recently from Chimney Park in Windsor. Both chefs are fully committed to hospitality, new twists on classic comfort food and a unique farm-to-table experience. To get their hands on fresh, seasonal ingredients, the chefs turn to new generations of local growers, like Jodar Farms and Morning Fresh Dairy. And some of those ingredients come from the Graham’s own farm just a few miles away. Preserving family farms means supporting them as businesses, Graham says, noting that thriving family farms and ranches feed a healthy community. And if food is love and comfort and connection, nothing says that more than using local ingredients in a pie made from scratch, served in a building that’s a slice of local history. “I want people to see this building as theirs,” says Graham. “A loved community space that people call their own and meet their friends and family here to celebrate…where people who don’t know each other—newcomers to town and people who have lived here forever —can take a class together, or share a cup of coffee.” Or a piece of pie. Ginger swears you need to add everything in order, just the way her grandmother did, for it to turn out right. She’s tried to do it differently, and it’s just not the same. Preheat oven to 450. Add ingredients in the exact following order: Beat eggs and salt until lemon-colored, then add sugar and beat. Add both corn syrups and beat. Add melted oleo and vanilla and beat. Pour into unbaked pie crust; filling should look foamy. Add chopped pecans. Line oven with foil in case pie bubbles over. Bake at 450 for 5 minutes, then turn oven down to 200 and bake until middle is firm (about one hour). Do not let pie filling boil. If you’re rolling out homemade crust, refrigerate for 24 hours to make it easier to handle.